With the Michael Jackson documentary making its way this month to Showtime, author of Michael Jackson FAQ Kit O’Toole, tells us 5 integral elements that made Off the Wall a modern classic. Read below! Michael Jackson’s landmark solo record Off the Wall is receiving the royal treatment this month, with Spike Lee’s documentary Michael Jackson’s Journey from Motown to Off the Wall debuting this month on Showtime. The original album will be reissued as part of a package bundling the CD with the DVD or Blu ray of the film. Lee’s movie serves as a reminder of the importance of the album, a sophisticated blend of R&B, funk, disco, and jazz that sounds as fresh today as it did in 1979. Artists such as Justin Timberlake, Usher, and Beyoncé still emulate its genre-spanning sound, winning crossover appeal with polished dance grooves. What makes Off the Wall so effective and timeless that it inspires musicians in 2016? Five integral elements contributed to the making of a modern classic. Michael Jackson’s voice. Producer Quincy Jones encouraged Jackson to explore the full range of his voice, particular the lower register. Renowned vocal coach Seth Riggs was hired to work with the singer, and their partnership would continue for the rest of Jackson’s career. From the moment a deeper voice utters “You know, I was wondering” at the beginning of the kickoff track “Don’t Stop ‘Til You Get Enough,” a more mature Jackson has made his entrance, announcing a new era in his artistry. His sensual voice wraps around the words in “Rock with You,” seducing a woman through music and dance. When he half-whispers “Love to run my fingers / Softly while you sigh,” Jackson demonstrates his skills as an interpreter, his phrasing perfectly suiting the mood of the romantic “I Can’t Help It.” If anyone doubted his skills as a vocalist before, Off the Wall immediately put those fears to rest. Quincy Jones’ production. When Jones met Jackson on the set of The Wiz, they quickly formed a personal and professional bond. Toward the end of filming, Jackson asked for recommendations for possible producers for an upcoming solo album. Jones subsequently suggested himself, a controversial idea at the time. Epic Records doubted Jones, a jazz composer and producer, could successfully oversee a crossover R&B/pop album. Instead, he used his jazz background to create a sophisticated album, drawing upon his vast musical connections to recruit the best musicians available. Artists such as George Duke (keyboards), Larry Carlton (guitar), Louis Johnson (bass, best known as a member of the Brothers Johnson), and Jerry Hey (trumpet) shaped the sound, while Jones protégé Patti Austin provided backing vocals and sang on the duet “It’s the Falling in Love.” Jones surrounded Jackson with seasoned singers and musicians, resulting in a cosmopolitan, polished sound that elevated disco to new realms. Rod Temperton’s songs. A member of the group Heatwave, Temperton penned hits such as “Always and Forever,” “Boogie Nights,” and “The Groove Line.” Recognizing his talent for blending jazz and R&B, Jones recruited the composer/keyboardist to write songs for Jackson’s new project. He submitted three tracks for consideration: “Rock with You,” “Off the Wall,” and “Burn This Disco Out.” To Temperton’s amazement, Jones selected all three compositions. The first two would largely shape the album, allowing Jackson to fully explore his range as well as his “percussive singing” ability. “Off the Wall” contains unusual, jazz-tinged chord changes in the chorus, and “Rock with You” includes lyrics that perfectly capture the romance (if temporary) of disco. After proving his hit making capabilities, Temperton would go on to write classics such as “Yah Mo B There” by James Ingram and Michael McDonald; “Sweet Freedom” by McDonald; “Give Me the Night” by George Benson: and, most famously, “Thriller,” “The Lady in My Life,” and “Baby Be Mine” by Jackson. Michael Jackson’s songs. During his time with his brothers as The Jacksons, Jackson had rapidly developed as a songwriter. His first solo composition, “Blues Away,” had appeared on the group’s self-titled 1976 LP; however, he proved his talent for writing catchy songs with “Shake Your Body (Down to the Ground)” from the 1978 Jacksons album Destiny. When it came time to begin work on Off the Wall, Jackson recorded three demos: “Don’t Stop ’Til You Get Enough,” “Working Day and Night,” and “Get on the Floor” (co-written with Louis Johnson). The first two tracks reveal Jackson’s love of heavy rhythm, with “Working Day and Night” allowing him to use his voice as a percussive instrument. “Get on the Floor” demonstrates how much Jackson enjoyed recording the album—his laugh and “woo!” toward the end of the song radiates infectious joy. “Don’t Stop ’Til You Get Enough” became a massive hit, foreshadowing future masterpieces such as “Billie Jean” and “Beat It.” Jackson clearly had a knack for writing R&B and dance tracks with pop appeal, a technique that would win over fans of various genres. Paulinho da Costa’s percussion. An unsung hero of the album, da Costa provided the intricate percussion heard on Off the Wall. Originally from Brazil, da Costa was an in-demand musician, appearing on thousands of albums as well as recording soundtracks for movies and television. His style mixes jazz, Cuban, and Brazilian influences, making him a frequent Jones collaborator. In his autobiography Moonwalk, Jackson names da Costa as an essential ingredient of “Don’t Stop ’Til You Get Enough.” Indeed, that track as well as “Working Day and Night,” “Get on the Floor,” the title track, and “Burn This Disco Out” would simply not work without da Costa’s complicated, driving rhythms. He was capable of more subtle work, too, particularly on the Stevie Wonder composition “I Can’t Help It.” Listen to Off the Wall through headphones to fully experience da Costa’s masterful percussive work. Off the Wall remains a classic because it sounds timeless, a remarkable feat considering it dates from the last days of disco. Jackson proved that dance music could be sophisticated and incorporate various genres. His willingness to cross boundaries and transcend simple musical labels would serve him well, the ultimate example being the crossover success of Thriller. Not stopping there, Jackson would continue experimenting with classical, rock, hip hop, R&B, funk, and pop throughout his career. The 1979 album would mark a turning point in Jackson’s life, one that officially established him as an adult artist with a unique voice. Off the Wall would provide a template for future artists to follow, challenging them to reach fans through intelligent, multi-genre tracks. When Jackson sings, “I sure would like just to groove with you,” listeners cannot help but obey. 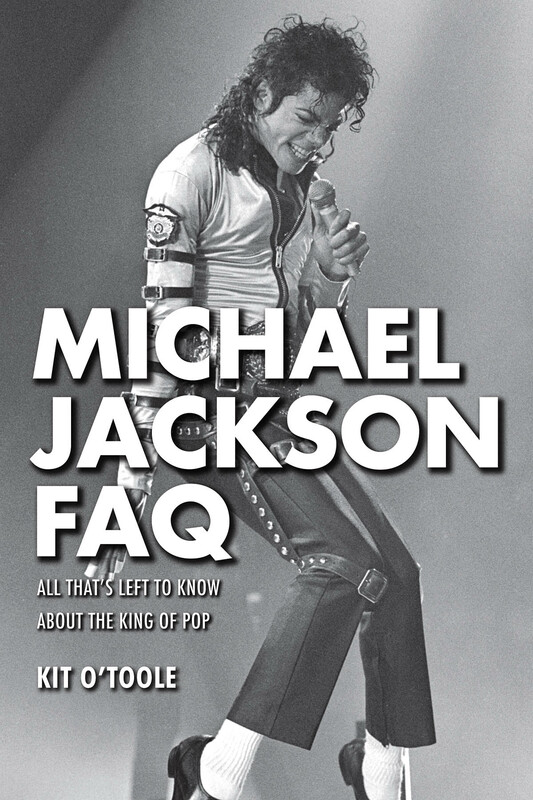 Kit O’Toole, author of Michael Jackson FAQ, spoke with Shane Button of 93.1 Moose FM. They spoke about her book and what inspired her to write it, as well as her favorite Michael Jackson song. Click play to hear more of what they had to say! Michael Jackson was the undisputed King of Pop, but his influence extends much further. From his childhood years with the Jackson 5 through his astonishing solo career, he consistently broke sales record, pioneered the modern music video, and infused dance into rock and pop. In Michael Jackson FAQ Kit O’Toole takes a fresh look at Jackson’s four-decade career, covering his work in three acts – the Jackson 5, the Jacksons, and his solo years. Along the way, O’Toole reveals details such as Michael’s earliest musical influences; the Jackson 5’s start on the Steeltown label; the key players truly involved in the group’s discovery; Michael’s transformation in to a prolific songwriter; his explorations of genres, from soul to disco to pop and hip hop; the tours, videos, and notable television appearances; his best-selling albums (Off the Wall, Thriller, Bad, Dangerous); outtakes and obscure tracks; and more. And there’s more! O’Toole covers the tumultuous, but successful, Victory album and tour of 1984; Michael’s major dance influences, including Bob Fosse, Gene Kelly, and Fred Astaire; the recurrent themes in Michael’s songs; and the posthumous releases through 2015, including Michael Jackson’s This Is It (1009) and Xscape (2014). Finally, Michael Jackson FAQ celebrates Michael’s legacy – his influence on countless artists from New Edition to Justin Timberlake, as well as his widespread impact on artistry across many media, from music to choreography to videography to fashion. Packed with detail and keen insight, Michael Jackson FAQ is essential reading for devoted fans and pop culture buffs alike. In Michael Jackson FAQ (November 2015, Backbeat Books, $19.99) Kit O’Toole takes a fresh look at Jackson’s four-decade career, covering his work in three acts – the Jackson 5, the Jacksons, and his solo years. Along the way, O’Toole reveals details such as Michael’s earliest musical influences; the Jackson 5’s start on the Steeltown label; the key players truly involved in the group’s discovery; Michael’s transformation in to a prolific songwriter; his explorations of genres, from soul to disco to pop and hip hop; the tours, videos, and notable television appearances; his best-selling albums (Off the Wall, Thriller, Bad, Dangerous); outtakes and obscure tracks; and more. KIT O’TOOLE is a freelance writer who has written about rock, jazz, and R&B for more than 20 years. Her work has appeared in print publications including Showcase Chicago and Goldmine, and she is a contributing editor for Beatlefan magazine. As a blogger, O’Toole writes for Something Else Reviews, Blinded by Sound, and Cinema Sentries, and previously served as a music editor for BlogCritics. She lives in Chicago. In this video, Kit O’Toole introduces her book Michael Jackson FAQ: All That’s Left to Know About the King of Pop! Watch the video below and let us know your thoughts on the book in the comments below!